Buddha Statues represent the “enlightened one”, the idol of the Buddhist religion. They are a symbol of Buddhism’s founder, Siddhartha Gautama, who preached that to attain Nirvana, a state without suffering, one must eliminate all craving from their life. This can only be done by pursuing the eightfold path. There is an extensive amount of information on Buddhism at About.com. The primary role of Buddha statues is to convey the calm feelings that reflect ones proper mental discipline as having the control over the negative emotions of fear and greed. However, Buddha statues also serve an important role in conveying teachings, particularly in traditional societies with low literacy rates. 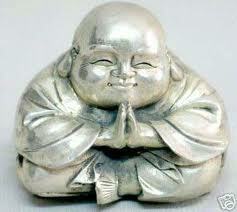 While Buddha Statues come in a wide variety of poses, the most common is the Buddha in Lotus Position. This is a position of meditation that symbolizes perfect balance of thought and tranquility. 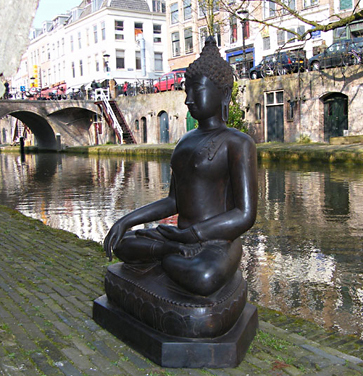 In this statue, the hand positions, called mudra, have the fingers of the right hand resting lightly on the fingers of the left as they lay in the lap of Buddha. The legs are crossed in what is called the Lotus Position. The left foot is placed on the right thigh and the right foot is placed on the left thigh. Many Buddha statues sit on a pedestal in the form of a lotus blossom. The lotus represents the Buddha Mind because, though growing in mire, it puts forth beautiful, immaculate flowers. Other popular positions include statues with the right hand raised in abhayamudra – the gesture of dispelling fear. These statues symbolize protection and peace in one’s home or garden. Statues Calling the Earth to Witness are represented by Buddha’s right hand touching the ground in a gesture that symbolizes unshakable faith and resolution. The reclining Buddha representing the Buddha’s death and passage to Nirvana symbolizes complete peace and detachment from the world. Some Buddha statues are actually based on Bodhisattvas, people could have passed to Nirvana, but instead chose to remain in this world out of compassion for other human beings. The Avalokitesvara’s main purpose is to listen to the cries for help from those in trouble and provide them with aid. He is the protector from danger and his sacrifice symbolizes infinite compassion, the sharing of mankind’s misery and a willingness to help those in distress. The eight arms symbolize his reaching out with compassion to save the world. The famous Chinese view of Avalokitesvara is a women known as Kuan Yin (or Kwan Yin). Is Buddishm and obstacle to buddism? Nowadays everyone knows what “Buddhism” is. You can find it in any upscale supermarket, gift shop, or bookstore. It will be next to the scented candles and the books on healing your inner child. 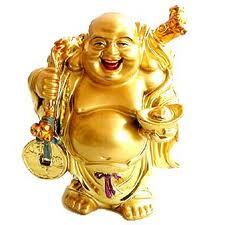 “Buddhism” has incense, kitschy little statues of Hotei (the “Laughing Buddha”), and wind chimes. It also has books with cute old Asian guys on the cover. They contain saccharine sayings and simplistic stories. Their core message is that if only we were all very nice, we could be happy. “Buddhism” is not such a bad thing. If everyone were very nice, the world would be stiflingly dull, but probably overall better. This kind of “Buddhism,” though, is at most only a tiny part of actual Buddhism. (Whether it is Buddhist at all is open to question.) Mostly Buddhism is not about being nice, and is not about happiness. I worry that the word “Buddhism” has become a main obstacle to teaching real Buddhism. As soon as you use the B-word, people think wind chimes, and you have lost anyone with a realistic attitude. Instead, you attract those who want “Buddhism,” which you do not intend to provide. Much of your teaching has to aim at correcting people’s pre-existing, wrong ideas of what Buddhism is. This problem gets worse all the time, as more and more people learn about “Buddhism.” Forty years ago everyone knew they didn’t know what Buddhism was; so they had open minds. Now many people think they know enough about Buddhism to be sure they don’t want it. What excites me about Brad Warner, and the punk dharma movement, is that they are evidence that I’m wrong. He uses the B-word, and definitely teaches Buddhism, not “Buddhism.” Yet he is popular with people whose reaction to hearing wind chimes might be to put on some nice soothing death metal and turn it up to 11, until the traumatic memory of the sound has been washed away. Still, Brad Warner’s thousands of followers, however encouraging, are a drop in the ocean. Buddhism needs to reach tens of millions of people who hate wishful thinking, not thousands. Some Buddhists have dismissed “Buddhism for punks” as a gimmick. Maybe it’s true that the connections between punk and Buddhism are superficial. Perhaps the analogy does not go all that far. But, at the very least, using the word “punk” proclaims that “this is a brand of Buddhism that is for people who are realistic about some things—people who hate fake niceness and moral hypocrisy and kitschy sentimentality.” That’s new and valuable. If that is a gimmick, then what I think Buddhism needs urgently is a dozen more gimmicks. A hundred more gimmicks. Buddhism should be available to everyone—and if it takes gimmicks to reach some people, let’s have thousands of them. Maybe we should do some brainstorming? Here’s an example. How about “Buddhism for vampires”? Vampires dominate the best-seller lists; they are nothing if not mainstream. But they do appeal to people who are a bit off-center, and open to slightly scary new ideas. And most vampire lovers are probably not into wind chimes. “Buddhism for vampires” is intriguing: what could that be about? Like “punk Dharma,” it makes it obvious that we are not talking about nicey-nicey New Age junk. “Buddhism for vampires” could be strictly gimmicky—annoyingly cutesy—nothing more than a quick way to cash in on two fads. But it could also be quite serious—for those willing to explore the razor edge of life and death, lust and aggression, monstrosity and nobility, horror and beauty, romance and madness, and the eternal moment where all these converge, in non-duality. These are main themes of Buddhist Tantra—and of vampire fiction. In fact, the connections between Buddhism and vampirism seem to me much more pertinent than those between Buddhism and punk. I may not take this too far, but I may offer some more details at some point. ©2007 buddhagardensculptures.com All Rights Reserved. • Design by Samir Kamble proudly powered by WordPress.